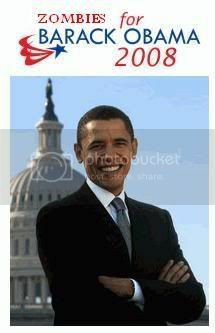 Democract presidential hopeful Barack Obama has definitely taken the world by storm; he has rallied Oprah, George Clooney, Halle Berry, Will Smith, and a large laundry list of others to his cause. However, now Obama's list of supporters not only transcends this world, but the netherworld as well. According to the article by the LA Times deceased actor Roy Scheider contributed $50 to Obama's campaign despite two months of advanced necrosis. Scheider was also unavailable for comment. While Scheider's contribution was mostly due to"clerical error," several members of another demographic have already been inspired to speak out in favor of Obama. Yesterday at City Hallin Los Angeles, several members of the zombie community came out to voice their support for Barack Obama. "If Scheider can voice his opinion despite his deceased status, then so canwe!" Chanted dead actor Denholm Elliot, who died of an AIDS-related illness in 1992. 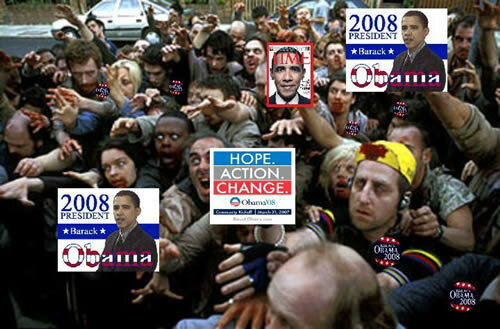 Zombie voters are now sprouting everywhere in the nation, from graveyards, hospitals and raves. Zombified Gregory Peck was speaking out against the Iraq War in Los Angeles, George Lucas was eaten by Sir Alec Guinness outside Skywalker Ranch (thank God! ),and Henry Fonda has formed a new zombie group. Here is their new poster. Democratic-supporting celebrities are already taking advantage of this new emerging demographic. Controversial actress Jane Fonda met with seveal zombified members of the former Weather Underground but was interupted when members of the Zombie Vietnam Veterans for McCain burst in and ate Jane Fonda. One veterans described it as "poetic justice." Ball of fire actress Lindsay Lohan was spotted staggering with a group of zombies outside the White House the other day sparking media hysteria as to the cause of her death. Upon further examination, it was discovered that she was just drunk. Barack Obama was surprised at this new demographic, but is seemingly embracing it. "They're not much different than my supporters on college campus; only difference is they're zombies while the college kids are just drunk." I think those are in short supply for the democratic party. STAY AWAY FROM THE DARK MEAT!!! Comrade! They are not short on brains, they merely have open minds, the sort that we can fill with CorrectThought™ for the Common Good™. I tried to fill an open mind with People's Tasty Creme(TM). It didn't make any difference. Perhaps they already had Tasty Creme(TM) for brains?